Why is it so hot in New York this summer? I’m almost starting to think that there might be something to this whole global warming myth! Almost. It’s a good thing I found something cool to keep my mind off the science. Just take all of that and throw it in a blender or food processor and let it go until you have a liquid. Put the liquid in the fridge until it’s nice and chilly. Then put the chilled liquid in the ice cream maker. You don’t have an ice cream maker? That’s ok. I didn’t either until about a week ago when Meg got me one for my birthday. (Thanks, Meg!) But past-Arthur could still have an awesome frozen treat. If you don’t have an ice cream maker, just throw the liquid in the freezer for a while until it turns to slush, then eat it. If it gets too hard, just put the frozen mix back in the food processor for 30 seconds or so. I ended up making both the ice cream maker version and the slush because I didn’t know, looking at watermelons in the store, how many cups of “chunks” they would give me. It turns out about half-a-pound of watermelon is a cup, as I learned when I bought about 5 pounds, twice the 5 cups I need for my planned sorbet. Both the ice cream and slush are perfect for a hot day. The watermelon flavor is fresh and crisp; even the bright color is refreshing. Scientist and brewers have teamed up bring the oldest known adult beverage out of the dust of history and into a glass. About 10 years ago archaeologists found pottery jars in the Stone Age village of Jiahu in northern China. After analyzing the 9,000 year old residue in the jars scientist were able to derive the ingredients (including rice, grapes, hawthorn berries, and honey) for the oldest known fermented beverage. The jars weren’t used to hold wine or a beer or mead, but something that was a combination of all three—a trend in ancient alcoholic beverages. Dogfish Head, a Delaware-based brewery famous for its production of ancient beverages, turned the old recipe into a commercially available product. 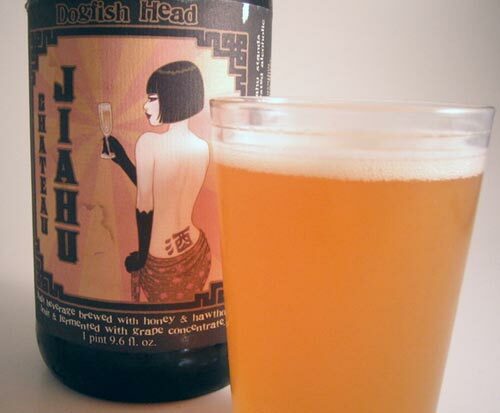 Named Jiahu, after the ancient village, the brew offers a chance to literally taste history. Look for a future post after I manage to get my hands on a bottle of Jiahu. The following is adapted from a restaurant review first publish in the Cardozo Jurist. Roberto Rosas and Ernesto Auila opened the City Tavern in late 2009 in the space that used to be the Italian restaurant Borgo Antico. 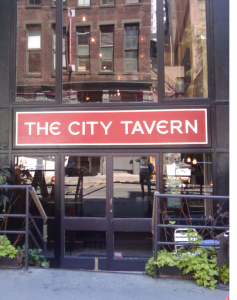 With an expanded bar and an elegantly spacious dining area, the City Tavern offers an ideal space for everything from a quick beer to a meal while watching the game to an upscale dinning experience. Roberto and Ernesto bring a combined 35 years in culinary experience and it truly shows on the menu. The food at the City Tavern is deceptively simple. Head chef Ernesto prides himself on fresh ingredients and cooks from scratch wherever possible. My first love from the menu was the burger. Lured in for lunch by the promise of cheap beer, I had what may be the best burger I’ve ever eaten that hasn’t come off of my own grill. Lightly packed, the burger is juicy and perfectly seasoned. The lunch special, with a soup, sandwich, and non-alcoholic beverage for $10, offers a great meal at a great deal. A clear stand-out among the sandwiches is the corned beef (which, true to form is corned by Ernesto on-site). The mushroom wrap, filled with savory portabella mushrooms and goat cheese, off-set by sweet bell peppers, is a find for vegetarians and carnivores alike. And, as with the burgers, the lunch special sandwich comes with french fries, double fried to perfection. The only culinary miss at the tavern is the ham and cheese sandwich. Plain and uninteresting, this sandwich should be passed over for the many delights on the menu. If you are willing to open your wallet a bit more, the pasta is not to be missed. Made from scratch daily, the pasta at the City Tavern exemplifies what pasta can be. The fettuccini Bolognese offers an explosion of flavor. The recently introduced crab-infused gnocchi in a saffron cream sauce is delicious and decadently rich. At the City Tavern the only thing that rivals the food is the friendly atmosphere. If you have been to the City Tavern more than once, you are probably already on a first name basis with Roberto and Ernesto. The bartenders at the City Tavern are just as personable: stop by in the afternoon or evening and sit at the bar and you will quickly become acquainted with the charismatic Matt and sassy Kathy. 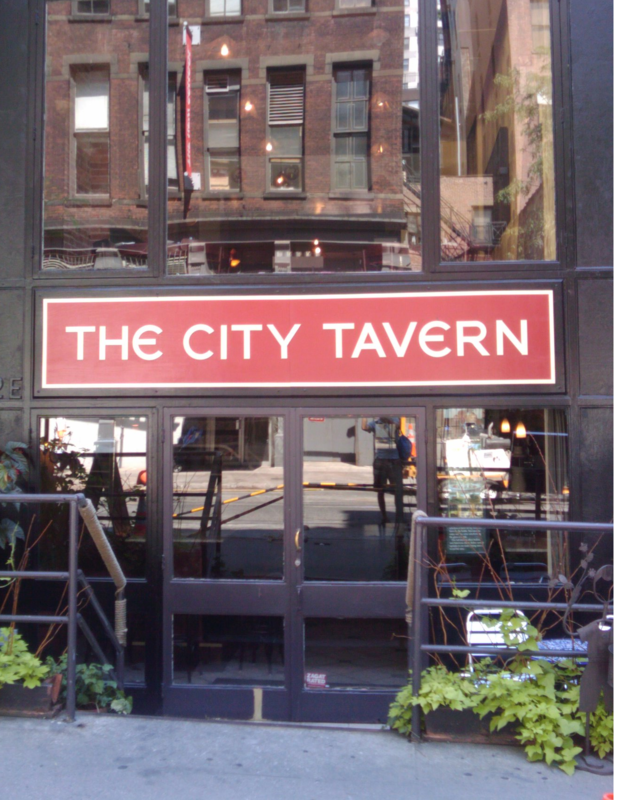 City Tavern also sticks to the basics of a great bar with great drinks. The newly revised cocktail and wine list there makes it easy to find that perfect beverage. 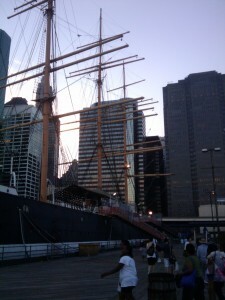 After a little stroll around Chinatown my lady friend and I wandered down to New York’s South Seaport. After almost two years living in New York I made the trip for the first time. Sitting on a bench at Pier 17, next to the water and the historic ships, in 90 degree heat gave us both a hunger for a little seafood. There were lots of restaurants around. But they all looked out of the price range of two poor law students, like a dodgy chain, or both. But even if we had the money, the upscale fair didn’t seem right. We wanted the kind of simple seafood that goes great with a beer. (Yes, Meg’s Boston roots have affected this Midwest boy.) With the help of Meg’s iPhone, we found what we were looking for—a dive bar with some fried clams on the menu—Jeremy’s Ale House. 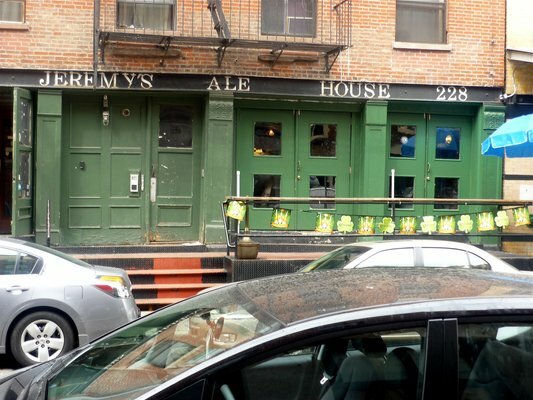 Jeremy’s is the kind of place you can smell from the street, in a good way. The smell of beer as you’re walking towards the door makes you look forward to the beer you are going to order all the more. The design of the place is Spartan and darkly lit with a simple cement floor. Still, even though it was early, about 7 in the evening, you can tell the place can get rock’n. 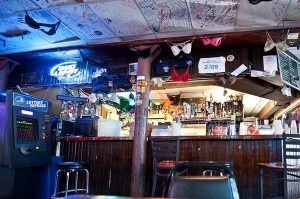 There are bras literally hanging from the ceiling which has writing from past visitors all over it. The beer comes one of two ways: small plastic cup or big styrofoam cup. The menu is simple, consisting most of baked and fried seafood and things that go great with baked and fried seafood (like french fries and onion rings). We ordered baked clams (something neither of us had ever had), fried clams (which, to our surprise, came with French fries), and onion rings (no need for a parenthetical comment about these). The food was the cheap greasy seafood treat we had been hoping for. The fried clams were crunchy and delicious. The onion rings were those magic ones where you can take a bite without the onion slipping out. The baked clams might have been more greasy than we were looking for, but with a little lemon and tartar sauce they were pretty tasty. Oh, and the French fries. Sometime I forget how much I love a simple french fry. And all of the food was great with our beers (a big boy cup for me and little cup for Meg). Jeremy’s is a place I am definitely going to be heading back to when I’m on the hunt for good, simple, fried seafood. Jeremy’s Ale House 228 Front St. Since I was a little kid, before I can even remember, I’ve had cheese cake for my birthday. According to my mother, the story goes that around my third or fourth birthday (which is in July) she made a cheese cake for President’s Day. I guess I liked it because I declared that I wanted to have cheese cake for my birthday. Not believing me, my mom made a nice chocolate cake. I’m sure it was great, but that wasn’t going to stop little me from throwing what I hear was an epic tantrum. So cheese cake became my birthday tradition. This year, the girlfriend, Meg, offered to make a cheese cake. We found a recipe in the Red Book (aka The America’s Test Kitchen Cookbook). The first step starts with cream cheese. A lot of cream cheese. I’m pretty sure it was my work here that led us astray. So apparently the Red Book told me that the two and a half pounds of cream cheese should be cut into nice 1-2 inch cubes before mixing with a hand mixer. I missed that bit of guidance. Meg’s old electric hand mixer met not so creamy cream cheese and just couldn’t handle the caloric mass. After about 60 seconds the right mixer thing (tong? prong? beater?) stopped working and fell out. Left with only a half a hand mixer things still seemed fine. Slowly but surely, the dying mixer softened the cream cheese and united it with the rest of the ingredients (eggs, vanilla, etc.). It actually reminded me a little of some of my favorite force improvisational cooking while cooking with friends back in Minnesota. Everything got mixed and poured on top of the gram cracker crust in the spring pan and put in the oven. 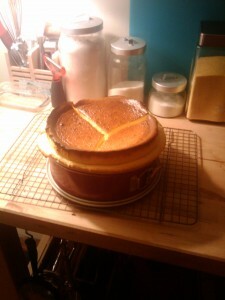 But when we opened the oven after the necessary time we had a surprise: cheese cake soufflé! The cake and popped up about two inches above the pan and was light and spongy to the touch (see picture). As we double checked the recipe to see what we missed and the cake cooled it sank in, just like a cooling soufflé. Then it hit me, all of our extra beating from the gimpy mixer must have filled the batter with air. Though Meg’s pre-war oven might have played some role as well. Now I just need to see if I can make a real soufflé when I’m trying! All in all, the cake looked a little strange, but still tasted great.